Tomorrow is Doomsday if you’ve been trying to watch your weight. Not to get all apocolyptic on you, but chew on this: The average person consumes around 3,250 calories at the Thanksgiving table. The FDA recommended intake is 2,000. You need to be eating less if you’re trying to lose weight. And let us also not forget that Thanksgiving marks the start of the month long eating binge known as the holiday season. But Thanksgiving (and Christmas and all those holiday parties and New Years) doesn’t have to be a diet wrecker. 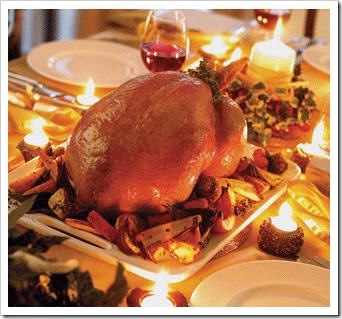 Wouldn’t you like to enjoy the Thanksgiving meal without the extra helping of guilt that usually accompanies it? Sure it’s not the easiest thing to do (Lord knows, I struggle at every big meal), but it works. Have a little bit of everything and instead of having second helpings of everything, help yourself to only those things you really, truly enjoy eating. I personally like to go back and have those things I only eat at Thanksgiving, like the stuffing. Sure you can swear off the carbs and pull the skin off the turkey, but odds are you’re going to be miserable and stuff yourself silly when dessert rolls around. If you enjoy what you’re eating when you’re eating it, you’re going to be more satisfied and therefore less hungry. And remember moderation applies to exercise as well, so after the dishes have been cleared, take a short walk. You’ll feel better about yourself and won’t second guess having pie for dessert. Above all, just remember to relax, enjoy the time spent with family and give thanks for your good health. On Friday, you can get back to the regular grind. This entry was posted on November 24, 2010 at 9:28 am and is filed under Diets, Thanksgiving. You can follow any responses to this entry through the RSS 2.0 feed. You can leave a response, or trackback from your own site.